• GURPS Reign of Steel – a desperate post-apocalyptic fight against robot overlords. • GURPS Technomancer – a modern-era world where technology and magic reign supreme. 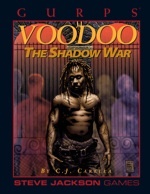 • GURPS Voodoo – a shadow war against the forces of darkness. Although designed for GURPS Third Edition, these worlds are still perfect inspiration for your GURPS gaming. 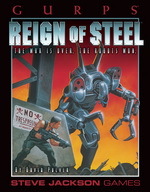 In fact, Reign of Steel even has a supplement – GURPS Reign of Steel: Will to Live – that works in tandem with the original sourcebook to upgrade the setting to GURPS Fourth Edition. These books join the dozens of others that are available On Demand, perfect for players who want their GURPS gaming in print. Check out what's available; your bookshelves will thank you! 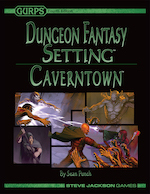 • GURPS Dungeon Fantasy Setting: Caverntown – a ready-to-use location for GURPS Dungeon Fantasy that brings the heroes closer to subterranean escapades than ever before . . . by being underground and within a stone's throw of a megadungeon! 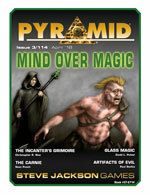 • Pyramid #3/114: Mind Over Magic – an assortment of arcane add-ons to your GURPS games, with evil artifacts, glass-based magic, and . . . carnies?! 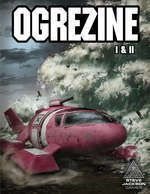 One more surprise arrived in April: fans of Ogre got to experience the incredible Ogrezine – a collection of 16 articles that include scenarios, fiction, historical essays, and variant options. If you somehow don't get rolled over by the giant cybernetic tanks, you might well be bowled over by the stunning new artwork in this full-color PDF.